Hi everyone! 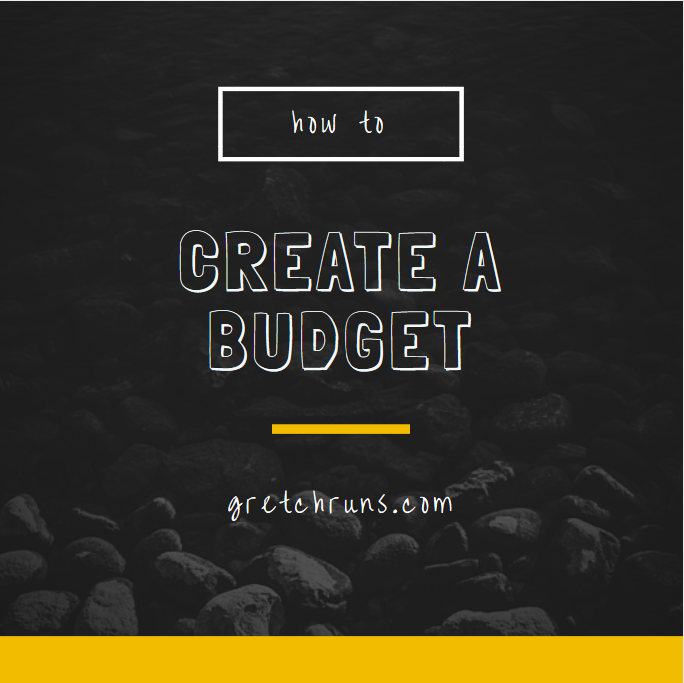 For today's Thinking Out Loud post, I'm going to be talking about something that was on my monthly goals list- setting a budget. 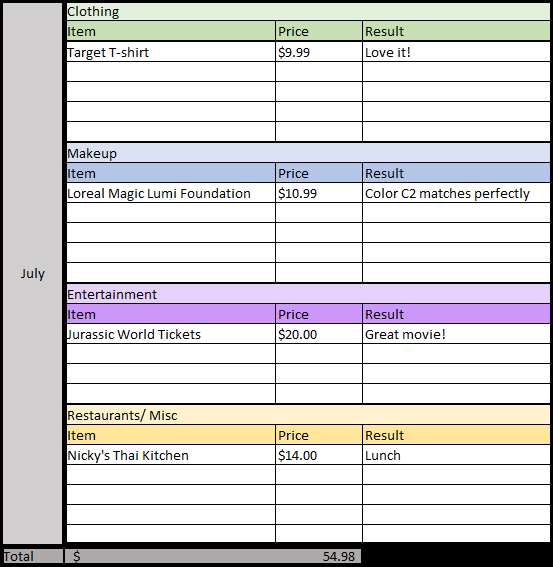 This is something that I've struggled with, so I decided to create a spreadsheet (my favorite..Excel is the answer to everything) and write out all of my income and expenses to figure out how much I could spend each month. I used a really simple method, and I hope that this will help you as well! I created a spreadsheet with all the formulas and everything built in (which you can find here if you're interested). You can download the file to Excel by clicking File>Download as>Microsoft Excel. In the future, I'm hoping to add a graph to show my savings over time and see how my spending is increasing or decreasing. That's to come! I divided the spreadsheet into two sections: Income/bills and Expenses. The first part is all of my monthly bills and expenses, as well as my monthly income. The second part is all about other expenses and non-bills. Just a note- I plugged in fake numbers because I'd rather not publicize how much I make and how much I spend each month! This is just an example. 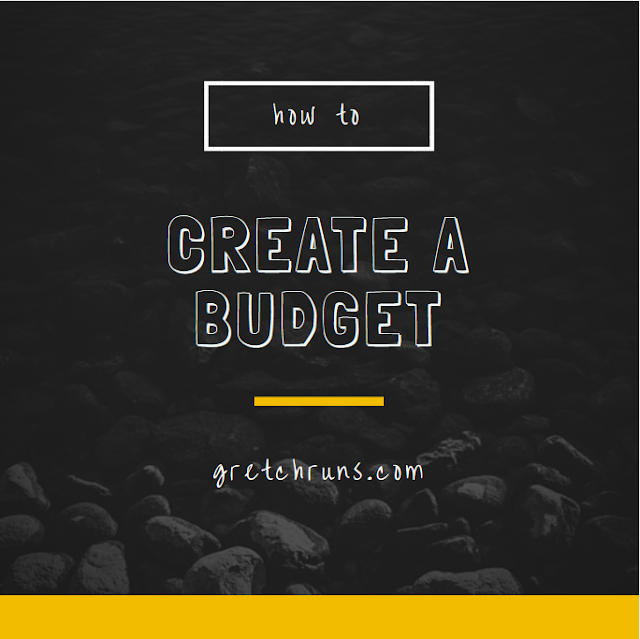 The spreadsheet I'm linking is all blank, and you can completely customize it to work with your budget! First, I write down my total income. There may be many sources of income for you, so make sure to write these all down. For bloggers, monthly income may change month-to-month, so try to find the average, or be on the safe side and write down what you make on a minimum each month. Next, I divide up my monthly bills in two categories: Necessities and Luxuries. Necessities are all the bills that I can't get rid of, like rent and food. I also auto-transfer money each paycheck to my savings, so I include this in "necessities" since I never really see this money. This is also where ongoing bills like student loans would go. I subtract my two "bill" categories from my income to get a left over/fun money amount. If this number is negative, you might want to consider cutting out some of the luxuries or picking up a side job to make some extra money. Next up I write down my monthly expenses, divided by category. I do this to see how much those small bills can add up over a month (especially things like buying lunch every day..it's insane!). I also keep track of what I think about those items, specifically for clothing or makeup. This way, if I buy something and decide that I don't even like it and haven't worn it, I will return it. Once again, this number should not exceed the number in "Left Over/Fun Money" above. If it does, that means that I'm spending more money than I'm making. If this happens a lot (shopping problems) I put myself on a budget and make it a goal to spend less than x amount per month. 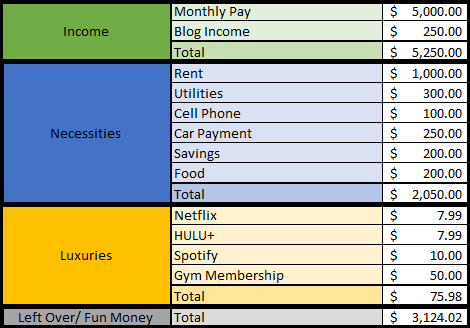 At the beginning of this year, I made it my resolution to spend less than $100 per month on "fun" things, and this really helped me stay on track! I hope that this little spreadsheet helps you out! Like I said, I like to keep it really simple. Seeing how much money adds up over a month was really eye-opening for me, and tracking everything has really helped improve my spending habits. What tips do you have for staying on track (financially)? My budget is kept by my wife... I will be honest I am terrible with money so my wife controls all that. She does use a spreadsheet like you have on here though, it works out so nice though and has made saving so much better. It's a good thing your wife can deal with budgets! I think spreadsheets really help out..I use them in pretty much every area of my life! Oooooh, this is a gooder. Yes, we keep a budget, but we're more lackadaisical with it than we used to be. When I was single, I used cash in envelopes and that was the best way for me to keep track of my money. It's also a great way to learn because it's so hands-on and visual. This is a great spreadsheet! Thanks for sharing! I've heard that method works really well! I haven't tried it, but maybe I will some day. I rely too much on credit cards! I'm glad this was useful to you, Suzy! I just started a budget immediately after reading this post. I love it and I love Excel : ) . I have been meaning to start doing something like this and I think this is vital to being able to be more aware of where I am actually spending my money. Thanks for sharing! That makes me so happy Jamie! Thanks so much :) I hope this helps you, and hope you're feeling better today! Have a great weekend! This is great. I don't keep a budget although I should track my grocery store spending a little bit better! I am real good at staying on top of my usual bills and try to never carry a credit card balance. The amount of money I spend on fruit though - yikes. Thanks for sharing your budget spreadsheet! I like the idea of breaking everything down in detail so you can see what items are adding to the total in each category. I've tried using money envelopes (only lasted about a week) but I use Mint on a pretty consistent basis.